"In the sixth year a battle took place in which it happened, when the fight had begun, that suddenly the day became night. And this change of the day Thales the Milesian had foretold to the Ionians laying down as a limit this very year in which the change took place. The Lydians however and the Medes, when they saw that it had become night instead of day, ceased from their fighting and were much more eager both of them that peace should be made between them." Although some argue that Thales used the Babylonian Saros period of 223 lunations it is now agreed by historians that the Saros period was not discovered before the fifth or fourth century BCE, therefore Thales could not have used that time system. There is a legend referring to the final battle of a fifteen-year war between the Lydians and the Medes, with ups and downs on both sides, but no decisive victory for either. 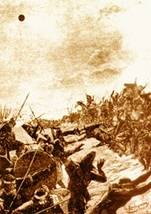 Also known as the "Battle of the Eclipse", it occurred at the Halys River on May 28, 585 BCE, and was suddenly terminated due to a total solar eclipse, which was perceived as an omen indicating that the Gods wanted the fighting to stop. The kings were impressed and stopped fighting. Since the exact dates of eclipses can be calculated, this battle is the earliest historical event for which a precise date is known. It is said that Thales was proclaimed a wise man by the oracle of Delphi in 582 BCE, possibly due to the eclipse prediction credited to him. However, it is clear that he did not understand the scientific basis of the phenomenon. An eclipse of the Moon occurred on August 14, 413 BCE, during the 91st Olympiad and influenced a battle in the Peloponnesian War. The Athenians were ready to move their forces from Syracuse when the Moon was eclipsed. It brought disastrous consequences to an Athenian army thanks to the lack of decisive leadership by Nicias, the commander. The Athenian army was confronted in Sicily by the Syracusan army and, having somehow failed, it was decided that they should embark and leave the island. Everything accordingly was prepared for embarkation, and the enemy paid no attention to these movements, since they did not expect them. But in the night there happened an eclipse of the Moon, at which Nicias and all the rest were struck with a great panic, either through ignorance or superstition. As for an eclipse of the Sun, which happens at the Conjunction, even the common people had some idea of its being caused by the interposition of the Moon; but they could not easily form a conception, by the interposition of what body the Moon, when at the full, should suddenly lose her light, and assume such a variety of colors. They looked upon it therefore as a strange and supernatural phenomenon, a sign by which the Gods announced some great calamity. And the calamity came to pass, but only indirectly was it caused by the Moon. Indeed, soldiers and sailors were very frightened by this celestial omen and were reluctant to leave. Nicias consulted the soothsayers and postponed the departure for twenty-seven days. 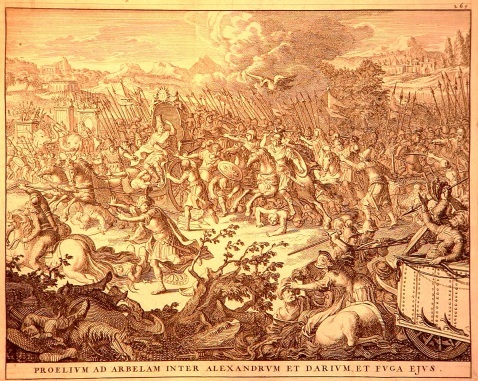 This delay gave an advantage to the Syracusans, who defeated the entire Athenian fleet and army, killing Nicias. "There happened an eclipse of the Moon, about the beginning of the festival of the great mysteries at Athens. The eleventh night after that eclipse, the two armies being in view of each other, Darius kept his men under arms, and took a general review of his troops by torch-light." This seems to have created considerable tumult in the Assyrian camp, a fact noticed by Alexander. His friends suggested an attack on the enemy's camp at night, but Alexander preferred that the Macedonians should have a good night's rest. It was then that he uttered the celebrated answer, "I will not steal a victory." This eclipse happened on September 20, 331 BCE, and the celebrated battle of Arbela, by its turn, was fought on October 1, 331 BCE.